Andre Iguodala is proud of his defensive effort. If Andre Iguodala were to be recognized with one of the NBA's end-of-season awards, he would prefer it be for his defensive work. The Most Improved Player category isn't a priority. "[All-Defensive team] is something you want on your resumé, because you don't want to be labeled as just a scorer or just a dunker," Iguodala was saying after the 76ers concluded a light practice yesterday at Philadelphia College of Osteopathic Medicine. "That's why I didn't do the dunk contest [during All-Star Weekend]. If your defense is always there, your game's always there. 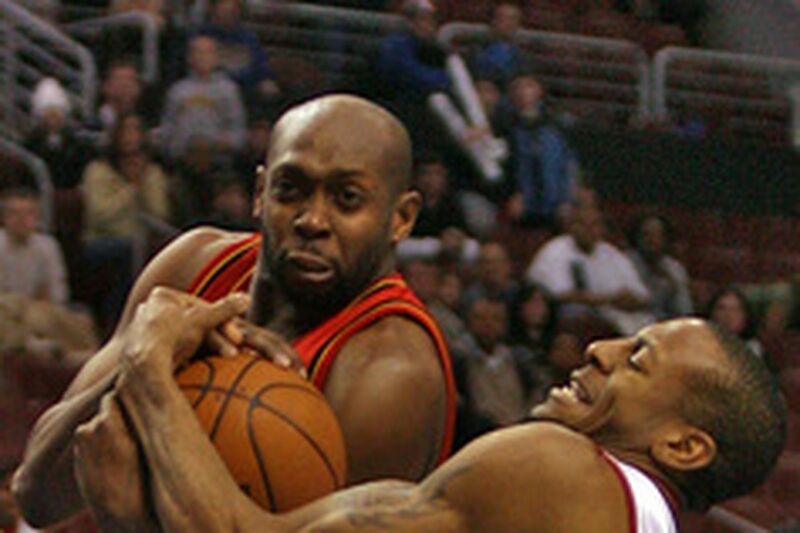 You can have an off-night [offensively] and still keep yourself in the game with defense. The ultimate compliment is that you're one of the best defenders in the league." Still, the NBA asks reporters and broadcasters around the league to vote for Most Improved Player, with the ballot having room for three names in descending order. Some of the candidates include Golden State's Andris Biedrins and Monta Ellis, Utah's Deron Williams, Sacramento's Kevin Martin and Iguodala. "I think Most Improved Player has a lot to do with opportunity and the position you're in," said Iguodala, who emerged as the Sixers' go-to guy after the December trade of Allen Iverson to Denver. "With Kevin Martin, his game has stepped up a whole lot. He was given an opportunity to shine. I don't think his game improved dramatically like that. I think he could always play. He was always capable of doing that. It's just the opportunity that came, and that's for a lot of players who get the award." Sixers coach Maurice Cheeks sees Iguodala's performance, including a 25-point, eight-assist effort in Sunday night's 109-104 overtime victory over Atlanta, as a natural progression. "I think the way he has played the last few months, he had to grow into that role," Cheeks said. "Once he did, [consideration for Most Improved Player] is not so far-fetched, because the way he has played has been pretty much amazing. He has helped us win as many games as we have because he has taken on that role of leader, the go-to-guy. "He could not do it if he didn't have the ability; the ability came out after [the trade]. He had it before, but he was able to exhibit more of his talents." Cheeks views the next phase of Iguodala's development coming in late-game situations, coming up with a signature move with which he can draw fouls. "The jump shot," Cheeks said, "is the last resort of winning the game [at that stage]. It all comes in time. It's not something that can be turned on right now. It's just things that are all in a process." Iguodala's plan is to put together a midrange game, using Orlando veteran Grant Hill as a model. "Definitely a go-to move, being able to pull up both ways and just really getting my midrange game down to where it's automatic," he said. Whether it's defined as improvement or opportunity, or a combination of both, Iguodala has come a long way from last season, when the suggestion was that he needed to develop his perimeter game and become more aggressive on the offensive end. He blossomed after the trade, when Cheeks made a concerted effort to put the ball in his hands more regularly.